In my last post on Sugar Terminals Limited I highlighted a company selling at a very low valuation available for purchase by only a few parties. Some of the feedback I received is that opportunities like Sugar Terminals aren't widespread, or don't exist for anyone who isn't a sugar grower. Thanks to a comment left on the previous post I've found an American company that appears to be even cheaper than Sugar Terminals Limited, and is available for purchase by anyone. Sometimes a market investor's viewpoint is limiting. Companies and stocks are interchangeable. Some investors will even reference companies by their ticker symbol. To many, even most, if a company isn't exchange traded it is un-tradable. Institutional mandates prevent many investors from ever investing in an OTC registered stock, let alone something more esoteric. In the United States every corporation has shares and shareholders. These shares are legally exchangeable if certain qualifications are met. This means in theory if you wanted to buy a piece of your plumber's S-Corp you could if they were willing to sell, and you could find a lawyer to complete the transaction. Even though most companies aren't exchange listed it doesn't mean that it's impossible to buy shares in many of them. There are brokers and companies that make markets in these private companies. Cardinal Ethanol is an example of a company I described above. They have shares available for sale, but are not traded on an exchange. Shares can be purchased through a specialized broker whose website lists trade prices as well as a crude order book. When a company's shareholder count crosses a certain threshold they are required to file with the SEC, which is the case for Cardinal Ethanol. The company also provides a nice newsletter on their website with a short and useful management statement about business conditions. The company is located in rural Indiana, which is ideal because their main raw material is corn. Corn is distilled into ethanol which is then sent to oil refineries to mix into gasoline for distribution. Ethanol is shipped from the distillery to oil refineries by rail. I have a picture of Cardinal's facility below to show their reliance on railroads. 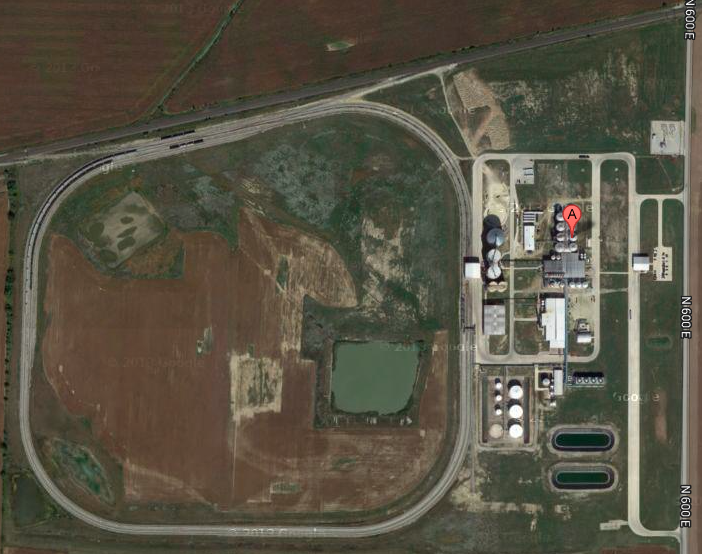 Note the giant loop for tank car storage next to their facility. Also note that across the railroad tracks from their plant are corn fields. The company's profitability has ebbed and flowed with ethanol prices, as well as with corn supply and price dynamics. They reported a loss in 2009, and a very small profit in 2012. They earned $26m in 2013, $25m in 2011, and $20m in 2010. These profit numbers are significant considering their market cap is $90m. The company earned $1,804 per share in 2013, which with a $6,200 last trade gives them a P/E of 3.4. The company pays out a large portion of their earnings as a dividend. Most recently the company paid $855 per share in dividends giving them a 13.7% dividend yield. If the low P/E and high dividend yield aren't enough the company is also selling at a significant discount to book value. Their shareholder equity after the most recent distribution was $124.53m. The company has $57m in current assets, of which $24m is cash, $20m in receivables and $10m of inventory. The majority of their asset value resides in their facilities, the plant and equipment. One could easily argue that their land and facilities aren't worth much because it's probably hard to liquidate an ethanol plant and sell rural land. The flip side of that argument is it's easy to sell an asset that's generating $25m in income a year, even if it's located in rural Indiana. The company had focused on paying down their debt in response to the financial crisis, and pressure on ethanol prices. Now that their debt is more manageable they are planning to focus on increasing the volume of ethanol they produce in an effort to push their plant to capacity. The company has a lot of operating leverage, if they are able to generate the volume they need their net income could see a significant increase. There are a number of risks to this investment. The first is the limited market for shares. While it might be easy to purchase shares it is probably not easy to get out, especially after a bad quarter or bad year when other investors might want to sell too. A second risk is really a dual risk, corn prices and ethanol prices. Corn and ethanol are closely related commodities, but they are also distinct. Factors that could change the price of one might not have an effect on the other. This could put the company in a situation where their input price is high and their output price is low. The last risk is that it might be a very long time before value is realized. Due to the extremely limited market these companies seem to trade off of dividend yield, not earnings or book value. While the company seems cheap on all reasonable metrics investors in this market might consider it fairly valued or overvalued. As trading volume is low it might be a long time before the company's true value apart from their dividend is recognized. For those able to stomach these risks the rewards appear appropriate. It's not often that a company like this comes along. How do I find more stocks like this? For a full outline of my personal investing system, go here. Are the share prices in USD, or in GBP? The FNC AgStock website lists prices, it seems, in British Pounds, which would affect your P/E calculations. When I look at the quotes the prices are in USD. I wonder if their site adjusts values based on location? Are you in the UK? The prices are all in USD, that would be consistent with their SEC filings. Thanks for the nice post. Everyone's comments were quite thoughtful. According to fncagstock.com the last price was 6200 € not 6200 $ - or am I wrong? I seems the brokers website uses whatever the local currency is. The currency is USD, my guess is you're in Europe? Hey, this is still a LLC. If you read the 10-K Part II - Item 5, they are still taxed as a partnership. Any investor would be issued a K-1 and pick up your share of income. The non-taxable return of capital distribution yield is a bit misleading - it would be enough to cover income taxes (depending on your bracket and state of residence) - with possibly a little extra - but not a true 13%. Good catch, I knew it was an LLC with membership interests and K-1's, I didn't think about the distribution being a return of capital. This is right - it merely offsets taxes you will have to pay via K1 - I confirmed this with the company a few years back. Ughh yet again another situation that is uncovered. You are killing a lot of opportunities (for the people like me trying to buy these things every day) by putting them in the public arena for people. Making it even tougher to buy stock in illiquid names! Great blog though. I'm not the only one doing any uncovering of these things. This idea was posted by a reader in the comments on my last post. Non-traded partnerships and illiquid businesses are nothing new. I don't expect you'll have much competition to invest in Cardinal either. The commission is steep, and there are onerous waiting period rules for posting offers to buy and sell. The fact remains that pockets of value remain even after they're exposed. Net-nets still exist, low P/B stocks remain, mutual conversions are still a source of profit. All of these things have been written up online, and in books, often famous books. Yet these are still sources of value even after everyone knows about them. Even though this is an obscure idea it seems others are quite aware of it based on the other comments. Even in the strangest places in the market one is never alone! Nice write-up.. I was thinking of doing some work on the company but figured it'd be too much of a tax headache as a Canadian investor. On the asset value side - Green Plains recently acquired 2 plants with 220 mln gallon capacity for $101 mln, net of working cap. Works out to about $0.46/gallon. If we were to give Cardinal full value for its wc, it trades at $0.47/gallon. Again I didn't dig too deep into why the facilities were picked up for cheap, maybe someone here will! Overall a great idea - cheap, illiquid, undercovered, insiders are aligned, hefty dividend. What more could you ask for. I'm sure this would be a tax headache. You'd probably have to file US taxes which is something you want to avoid if you can! Yes, the ethanol cuts are the big risk coming down the line. That coupled with commodity price changes is why there's a lot of risk in something like this. Interesting on the assets, thanks! issues with you or any foreign citizen purchasing Cardinal Ethanol units. " Parry -- the ethanol plants acquired by Green Plains were distressed assets that had been foreclosed upon by the secured lenders to Biofuel Energy. I am not familiar enough with the buyer universe for ethanol plants to know whether Green Plains was the only bidder or not, but as long as traditional creditors (banks, thrifts, insurance companies, specialty lenders like GE Capital, etc., NOT distressed hedge funds) receive par for their claim, they are generally less focused on maximizing price for the collateral and more focused on speed/certainty of a sale. My bet would be that Green Plains got a steal on these distressed assets given the circumstances, so $0.46/gallon would NOT represent "fair value" if I were a betting man. That would make sense, thanks for the dig. Hi, Nate. Commenting yesterday inspired me to dive for a few minutes into ag stocks again. I followed my own advice and Googled Ag Stocks, which let me widen my circle beyond those offered on FNC Agstock (formerly owned by Alerus). think US Premium Beef is quite interesting--distributions on the B units (those which you or I can buy) have been historically higher than the current offer price! Worth a bit more research, anyway. Leucadia's involvement is also interesting, For some reason USPB filings don't show up in a regular SEC search, but if you just Google them you can get them. Something to keep in mind is that, in addition to the slow posting and high trading costs, there are sometimes minimum-lot requirements (usually 100 units). That, along with the fact that many of the offer lots are in the hundreds for units which cost hundreds of dollars apiece, also provides a barrier to casual purchasers. Thanks for the comments, you clearly inspired this post and this research. Sounds like US Premium Beef is worth some research here. I noticed some of the trading restrictions. These aren't shares to move in and out of, and at times a significant amount of capital is required to just open a position. It looks like USPB will lease the delivery rights on the A units for you at $8/unit...so that's a 5% annual yield if you buy the A units for $160. In the same release, USPB says that the premium was $68/head for cattle delivered to USPB...which makes the $8 lease right seem like a bargain, no? Are the A & B units identical except for the delivery rights? What is with the new signature? Is this a cryptic warning of an impending crash? Wait, it all makes sense now. All your talk lately about buying cabins in the woods... you have become a prepper haven't you? You're putting too much thought into it. I was listening to a couple Genesis albums while I wrote the post. The lyrics from Deep in the Motherlode seemed to fit the topic at hand, so I included them. I do enjoy the woods, camping, hiking, skiing etc. No worries about me running off to the hills to avoid impending doom. According to the media the world has been ending since the printing presses started. Maybe something bad will happen, I'll be just as screwed as everyone else. Maybe somone should write a blog called oddballmarkets. Have you had a look at www.sharmark.com. It's a UK based bulletin board type system for trading unlisted stocks. I have no idea whether an American (or anyone who is not UK based) would be able to access this market. It has another of these agricultural opportunities which are only available to those in the business - a milk co-operative which I think you can only buy if you a dairy farmer in the UK - but it looks like a potentially a nice business if one could buy it. I actually have positions in a couple of the stocks on there - Sysmedia (I think I remember you blogging that Metalink was the simplest company you had seen - Sysmedia may be even simpler) and Spectrum Technologies (a niche aviation business). And I think the Isles of Scilly Steamship Company has the best company name I have seen in a while. Nate, out of general curiosity, does this site generate any revenue for you?